How best to present a journey of 11 ordinary individuals from around the World in an ordinary Australian Taxi through not so ordinary Western Australia outback? Of course, on an interactive Google Map! 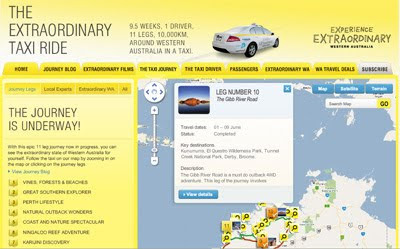 The map is a part of The Extraordinary Taxi Ride website created by WA Tourism to attract local and overseas travellers to visit this wast and unique in many respects part of Australia. It has been created with Flash version of Google Map and depicts the route the travellers took on 11 individual trips. The map is annotated with commentary and photos marking significant points of interest along the route. This is one more example of creative use of spatial technology in tourism marketing and PR campaigns. 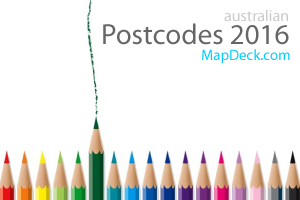 The key point is that simple online maps are finding their way into more and more diverse range of applications, not necessary as the main feature but nevertheless, as an important element of the overall package. 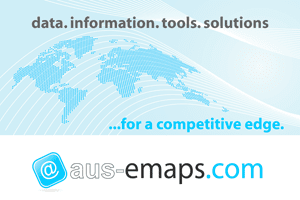 There is enormous opportunity for creative application of traditional GIS functionality however, the simplicity of building interactive online maps also poses a challenge - it is not easy to convince project sponsors to use experts for the task rather than just web developers and graphic designers.